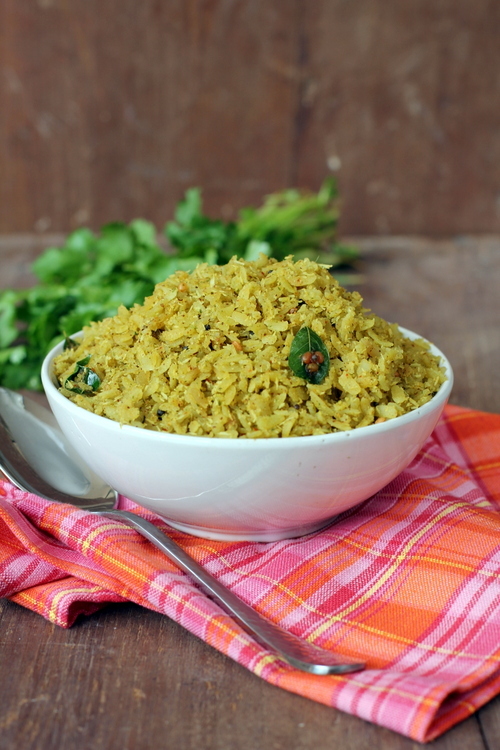 Coriander Poha or Kothimeera Atukulu (Telugu) is a simple yet flavorful dish where poha is flavored with fresh coconut and fresh coriander leaves. The flavor of coconut and fresh coriander shines through and the scent of the spices makes it special. 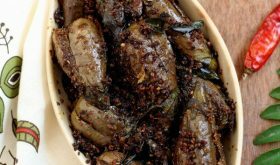 It is an amazingly flavorful dish that you can prepare when unexpected guests drop by or can be served as fasting food during festivals. It is a winner of a recipe and do add it to your repertoire as its a change from the everyday boring upma and the likes. It is light on the stomach yet filling enough to see you through the morning hours before lunch. Wash the beaten rice and drain. Sprinkle 4 to 5 tbsps of water over the beaten rice/poha and keep aside. 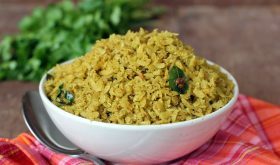 Grind grated fresh coconut, fresh coriander leaves, green chilis, lemon juice, jaggery, rasam powder and salt to a paste by adding three tbsps of water. Mix the ground coconut mixture well with washed beaten rice and keep it aside. Heat oil in a vessel, add the mustard seeds and allow them to splutter. Add the urad dal and cinnamon stick and fry until the dal turns red. Add the curry leaves, asafoetida and turmeric powder and fry for a few seconds. Add the beaten rice mixture and give a good toss so that the contents are combined well. Allow to cook for a mt, adjust salt, turn off flame and serve warm. Rasam powder is an optional ingredient. By Sailu Published: October 23, 2013 Coriander Poha is a quick, tasty dish among kids tiffin recipes. Kothimeera Atukulu as known in telugu has coconut and coriander leaves as main ingredients. looks very interesting… gotta try ! Did u use white poha or red poha? White. You can use red/brown also. In terms of washing how can we make poha not completely watery. Because when I tried earlier the poha became like upma. So in simple way in what way we need to wash so that poha doesn’t turn like pasty way..
Basically wash it in a colander. The water will drain completely. Also do not use the thin flakes, use the thicker variety of poha. Wonderful recipe. I am going to prepare this tomorrow morning. In between please tell me, can we add peanuts, chickpeas to the above mix when we do the tempering ?? Yes, you can add roasted peanuts and roasted cashewnuts also. Never heard abt this. Very interesting…. It is a different take on the normal atukula upama that I make. Will try it soon. Meanwhile, do you have the recipe for ginger vegetables / ginger baby corn served as a part of Chinese maincourse in most restaurants? My kids love it but I haven’t yet come across a good recipe for the same. By the way, your red velvet cake has become a hot fav in my family. Bet you can do the same thing with oats instead of poha! Hi Sailu, I have never tried coriander poha…a new one for me. Sailu, planning to make this for varalakshmi puja this friday, how long do I need to keep the mixed poha before I add tadhka?